New Adult has been a genre I’ve loved for a while, but I’m starting to stray away from it. Too many New Adult novels have the same storyline and same kind of characters. Fortunately, Caged in Winter doesn’t follow the same kind of story like all others. 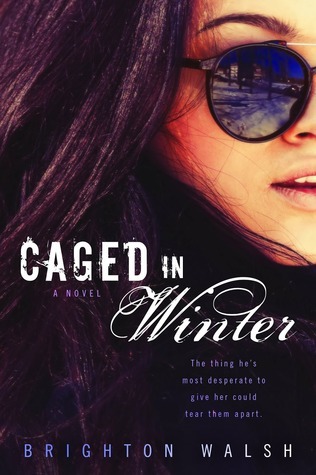 In fact the characters in Caged in Winter is what kept me clicking my Kindle to keep me reading. I loved every bit of the chemistry of Winter Jacobson and Cade Maxwell. The moment they met to the very end of the book for their HEA. They definitely kept me intrigued for their story. You have the most independent female character, Winter Jacobson (which I just adore her name) who can handle anything that is thrown at her. She’s had a crappy life from the beginning, but that is about to change once she graduates and leaves the job that just pays the bills. Although, Cade Maxwell is going to change her life and at first she’s not liking it at all. She doesn’t need a knight in shining armor. She even lets him know it. Cade Maxwell has had a rough life as well, but his life has been amazing since the moment he decided to follow his dream. He’s having a hard time grasping what the future holds, especially when it means leaving his sister and niece behind, but life is going to be even more complicated once he meets Winter. The two characters clash at first and when I mean clash…I mean full on Winter is about had it with him. Cade though is determined to win Winter over. The poor guy had to deal with Winter’s attitude for a bit, but he doesn’t really realize what Winter has gone through in the past until she finally comes out and tells him. The only thing that bothered me was how Winter kept pushing off Cade in the story. She’s not open to trust people and she doesn’t want to need someone, especially when she’s proving she can do it all by herself. She’s one hard-headed girl, but I have to give it to her. She’s one determined girl who is trying to prove she’s strong. Once you find out what has happened to her, you will realize why she’s the way she is.